Audiobus not only allows you to route audio from input apps to output apps on your iPad or iPhone, but it also gives you some control over all of the devices from the side control bar. When you’re recording parts to a DAW, you can switch over to the instrument you’re recording and start the recording process from there. 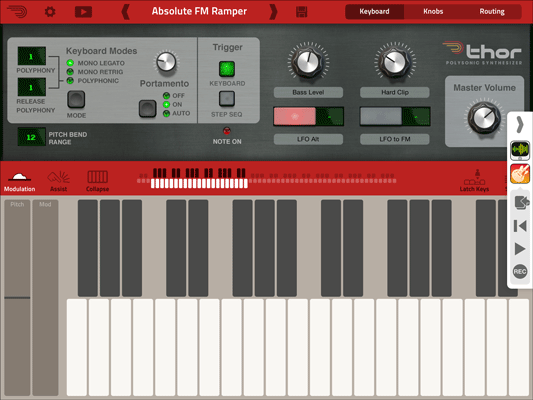 Depending on the MIDI functionality of the apps, you can even sync the input and the output apps for recording (to help start and stop loops at the correct times). Let’s take a look at a couple of examples. 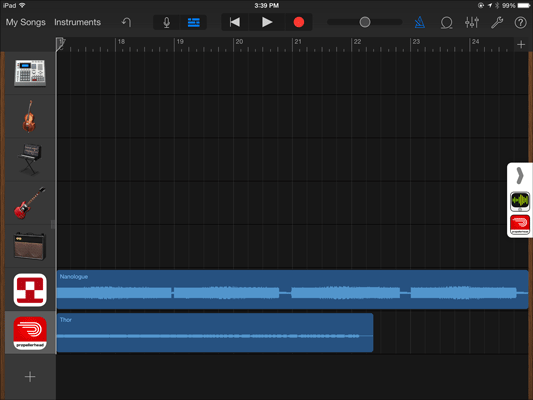 For this example, you’re going to put the Thor synthesizer app as the input app and GarageBand as the output app. Switch over to the Thor app and expand the control bar. Tap the Record button and play your part on the Thor synth. When you’re done, you can tap the Record button again to stop. Switch over to GarageBand, and you see the audio recorded from Thor. Notice also that there is a track of Nanologue in there as well. You can use Audiobus to record multiple streams of audio into a single DAW with no issue. The preceding process provides a straightforward solution for recording live parts, but what if you want to record parts from a drum machine or similar loop-based app? Again, Audiobus does a good job of routing audio, but you may need to do a little work to get loops to work correctly. This functionality depends on the apps you use to perform your recording — you’re looking for the ability to handle MIDI clock and sync here. Check out sites provided by developers for blogs and videos that might help you out. Start up both apps, then go into Loopy HD. Expand the sidebar in Loopy HD. Scroll to the Tempo setting and set the tempo you want to loop at. Scroll down until you see the Clock Outputs section. Tap Gadget and make sure the checkbox shows up next to the name. 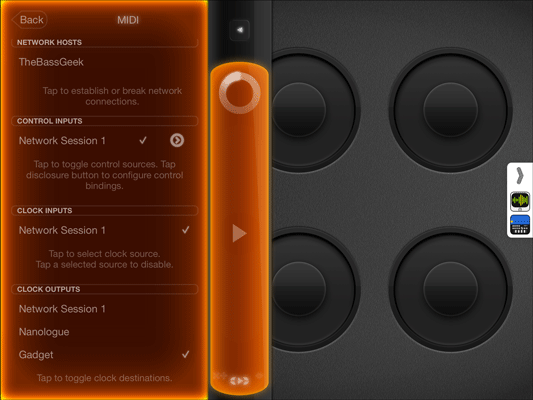 Tap the Gadget icon in the Audiobus control bar and return to the Gadget app. Tap the Loopy HD icon to show the controls. Tap Record under the Loopy HD icon to start the recording. Gadget starts playing and Loopy HD records the audio to a loop. When the loop stops recording, you can switch to another pattern and record that, or just close the Audiobus and Gadget apps and be done with it. Notice that if you leave Gadget and Loopy HD playing at the same time, you hear a slightly phased tone to the app? Because there’s a slight delay in the original and the looped audio, you’re hearing that delay expressed as that slight phasing. Turn off Audiobus and play the loop in Loopy HD by itself, and you’ll be just fine. Remember that there’s always a slight latency between the original audio source and anything recording in Audiobus because the audio had to go through another app. Now, please remember that syncing varies wildly from app to app, so this process won’t necessarily work for every audio app you encounter. The important thing to remember is that you need to set an app as the clock master to sync other apps to that single timing source. Without that sync functionality, you’ll be at the mercy of tapping the control and hoping you hit it at the right time.